Husayn ibn Ali ibn Abi Talib and his family left Madinah on the 4th of Rajab in the year 60 AH, and reached Makkah on the 4th of Shaban. They stayed there for some time, but they did not complete the hajj as they had pretended to do. Instead, on the 8th of Dhu’l Hijjah a small caravan set out to Kufa in Iraq, Ali’s former Capital. It was on a hopeless mission. The plot against Yazid, the infamous and so much hated Umayyad Caliph, Muawiya’s dissipated and incompetent son in Damascus, had been betrayed. When they reached the Euphrates, the ringleaders had been executed already. Husayn, his family and his men, not more than a few dozens, would have better been advised to surrender. The enemies’ army consisted of thousands. But the brave knights didn’t. The battle on the banks of the Euphrates at Karbala, on the 10th of Muharram in the year 61 AH, the day of Ashura, didn’t take long. Although Husayn was wearing his grandfather’s cloak and took-up the Dhul’fiqar, Ali’s famous double-bladed sword, it didn’t help. He and all men of his army were killed, and women and children deported to Damascus. Yazid himself ordered the mutilation of Husayn’s body. His severed head was also carried to Damascus. His little daughter Ruqaiyyah, who was desperately asking for her father, was shown the head, and she died on the spot. Her shrine in the old city of Damascus is full of toys; she was only 5 years old when she died in a shock. 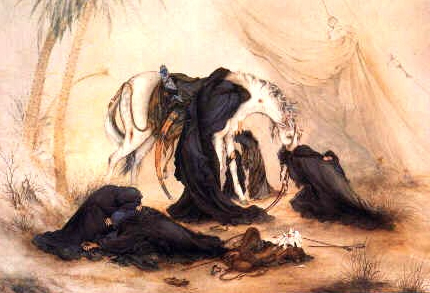 Lady Zaynab was later sent back to Madinah where she died the following year. Her shrine is in a mosque in the vicinity of Damascus. Another is in Cairo, Egypt. Some people assume her tomb in Madinah. The first 9 days of Muharram, the first month of the Islamic calendar, are dedicated to intense mourning in any Shi’a community, be it in Iran, Iraq, in the Emirates of the Gulf or in the Eastern regions of Saudi Arabia. The Ashura Festival on the 10th of Muharram commemorates the events of the Battle at Karbala and the Martyrdom of Husayn with vivid performances, processions, and a shocking brutality of self-flogging of young men and boys. If you won’t believe that there is a close, at least spiritual, relationship between Roman Catholic Church and Shi’a Islam, have a look at (very realistic if not real) crucifixion scenes on the Good Friday in the Philippines. This entry was posted in Iran, Iraq, Islam, Religion and tagged Ashura, Bibi Zaynab, Imam Husayn, Karbala, Muharram, Shi'a, Yazid. Bookmark the permalink.